Murkin the dog is a former stray who was adopted out of a shelter in Santa Clara, Calif. His owners classified him as very shy, timid, and wary of strangers, until they worked with him to increase his confidence around new people. These days, the handsome boy is a "total love bug," cozying up to anyone who is willing to give him attention, treats...or both! Murkin's eclectic range of interests include dog treats, naps, and long walks on the beach, but most of all, "he loves cuddling and snuggling with baby kittens." 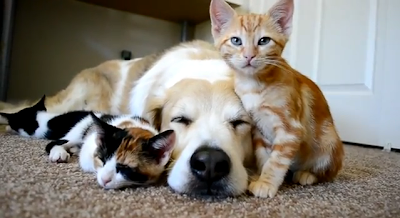 I only posted two examples here, but if you have a few hundred hours to spare, be sure to head over to his official YouTube channel to watch countless videos showcasing this kind-hearted canine at work with his foster babies. Hip hip hooray for Murkin the pup! Making a good name for cat loving dogs everywhere! Sounds like our kitty-magnet Tommy! What great videos... We don't know any dogs in person. Murkin seems like a good guy to know. That's for sure.